So you’re starting a blog or you want to learn how to promote blog posts better. That’s easy, right? Just share it on social media and your content will take off. If only it was that easy to get your content to catch on. That’s why you’re here reading this. It’s not that easy. There is a bigger struggle than most people realize when you’re publishing content for your audience. It’s not as simple as publishing great content and then pushing the share button. No, building great content no matter how wonderful it is won’t bring many people to it. You’ll learn how you can overcome some of the struggles that happen when you promote blog posts. You’ve looked up how long an ideal blog post should be. You’re producing 10x content that people are supposed to love. The problem is you’re not getting any traffic. Either that or you’re getting very little which is like getting none. Sharing it on social media is sure to make the content catch on right? You simply have to push the publish button and wait for people to start pouring in. Unfortunately, it doesn’t work that way. Social media is huge and it’s easy to get drowned out by the sheer masses of people sharing content. Amazing content and sharing your content doesn’t work so you’ve just about given up. If you create this amazing content, share it and still no views then it’s hopeless. Well, not quite. There’s a lot more to it than that. If that’s all you’ve done at this point then don’t fret, read on and do the work it takes to promote blog posts and make them a success. You have to have a basis to work with before you can promote blog posts. Before we begin resolving the problem of nobody visiting your new blog posts you first have to have a solid foundation. Nothing will work without a solid foundation. This foundation will help you when we look at how to resolve our problem. You must write something that people care about. If nobody is looking for a topic and nobody is writing on it, it’s not going to get many visitors. You have to find topics that people care about. They have to already be searching for it or sharing it. It’s not easy to make traffic out of nothing. If your topic is about something nobody cares about then no matter how hard you try, it’ll likely fail to catch on. Unless you know you’re onto something huge and it’s a sure thing then uncharted territories might not be the best place to be. That doesn’t mean there’s no room for this but don’t expect a huge burst of traffic in the beginning. New topics on new industries are going to take a while to catch on. Not only that but to catch on there’s a lot of work involved getting people to care. Why do you think startups are so hard? It’s all about spending the time to get good blog post ideas. You’re already doing this for your blog, right? If not this is a must. It has to be good content that has a goal of helping the reader though. You also can’t forget that it must resolve a problem the reader has. To rank well for a topic that’s already been published on you must publish 10x content. That means your content should be 10 times better than the next best option. Even if you’re not writing on a highly competitive topic you’ll want to make some pretty amazing content. You don’t want to make it too easy for your competitors to create 10x content and bump you from the top. To make 10x content your goal must be better than to sell too. It’s impossible to make 10x content with the single goal of selling something. Your goal should always be to help teach the reader something new. Ditch the always be closing (ABC) mantra of sales and get into the always be helping (ABH) mindset. Teaching someone something or helping them solve their problem is a noble goal and one that you must adopt. Writing for sales will always fail and people will see right through it. Every blog post needs a call to action of course but it should only be an assist to the article rather than the whole point. If your call to action is your only resolution and someone has to pay money to resolve their problem then you’ll have some disappointed readers. Great content won’t make your content explode but it will help you a lot. Consistency is a big contributor to an overall successful blog and successful blog content. After blogging for a while you’ll build up an audience. Your audience won’t consistently view your content if you don’t consistently post. With a consistent posting schedule, people will know exactly when to expect your amazing content. Not only that but they are less likely to forget about you and stop reading altogether. You’ll lose potential business and potential recommendations if you lose your loyal audience. Choose a schedule to post on and stick to it whether it be the first Friday of each month or Monday-Wednesday-Friday. I think this is so important I included a post calendar in my 5 blogging tools you can’t live without. Pick a schedule, plan ahead, and stick to that schedule. The world won’t end if you miss the occasional post. For the most part, you should stick to it though. If you start with these as the basis for making content explode, you’re on a good path. Now it’s time to actually make your content explode. You pushed publish and your content is out there for the world to see. This is the point where only half the battle is fought. It’s time to roll up your sleeves and get to work making your content visible to more people. Without making it more visible then it’ll never explode and start getting you more traffic. Once you push publish on your current blog post you’ll want to share it with your audience. Maybe you don’t have a huge social media audience. That’s OK, some is better than none and it’ll get things kicked off for your blog post. Add it to your queue to be shared with your followers. Don’t stop there though. Keep on sharing your content at regular intervals. There’s no rule on social media that says you can only share each piece of content only one time. With the right tools, it’s easy to do some social media marketing without much effort. Schedule out your posts at regular intervals so each article is shared multiple times. Don’t simply publish the same social media post though. Phrase the share in different ways to change it up a bit and maybe catch an all-new audience each time. I know I’ve seen the same content shared more than once and clicked on it multiple times. That’s because each time the message is formulated different but the link goes to the same place. You can easily double your traffic to your post with this method. Heck, it’s even possible a post might go viral. 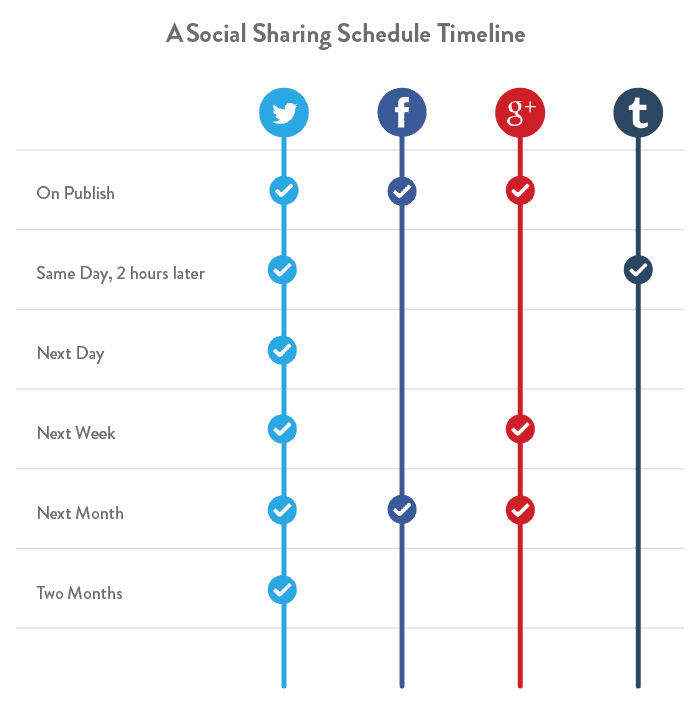 OK, so you have a more extensive sharing schedule now and reach more people on social media. It’s still all about people coincidentally running across your blog post though. Coincidence isn’t exactly the best way to promote blog posts. There is more you can do by using social media, search engines, and a few other tools to some reaching out. This is the hardest part but has the most potential payoff. Sometimes you have to roll up your sleeves and do some hard work to get your content out there. That means finding people who have shared similar content. Either that or they’re linking to similar content and yours is even better. You’re going to have the easiest time with a paid service to find social influencers but that’s not always necessary. 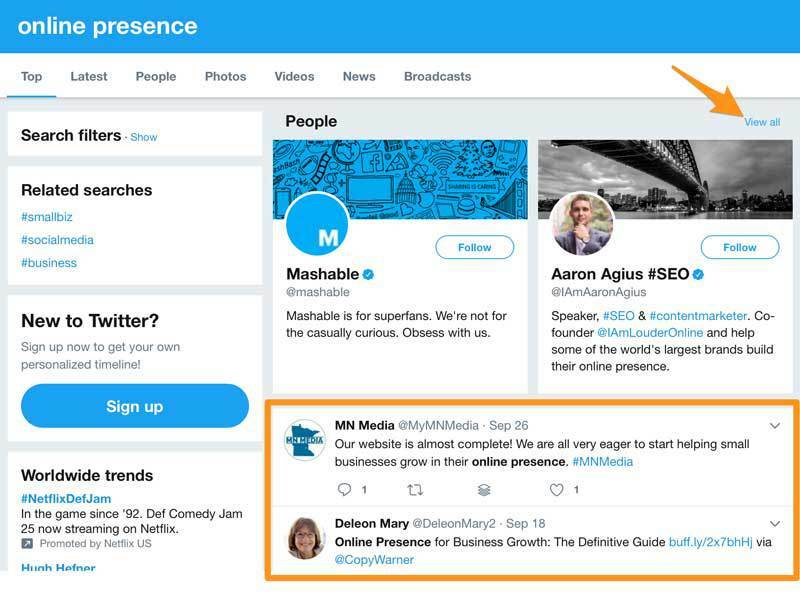 For social media influencers on your subject, you can use the Twitter search feature. Twitter will turn up a list of people who shared similar content to your blog post. I did a search for online presence above. Twitter is showing me a list of Tweets on topics related to online presence. It also shows the people who are relevant. You will see a whole list of Tweets but only two people. If you click the View all link then Twitter will show you lots more people who are potential influencers you’ll want to contact. You may have to do a bit of sifting and browsing to find those who are more likely to be influencers among all the Tweets. Once you find the right ones simply do some research on how to contact them by email. If you want to make things really easy on yourself but fork out some money, BuzzSumo is an amazing tool. BuzzSumo allows you to search the topic of your blog post and see similar posts that have been shared. With the paid version you can see who the top influencers are who shared any piece of content. It’s pretty amazing the depth of information they can provide you. Whatever you choose you’ll end up with a list of influencers you’ll need to contact to see if they want to share your content. Who knows, maybe you’ll end up with a link to your website on one of their blogs if your content is amazing enough. If you want a lot of views AND you want to increase your search ranking then this is the way to do it. You’ll have to do a bit of hunting for the right people but in the end, it’ll be worth it. There’s no better place to start this strategy than with Google itself. You can simply search your keyword in Google. Do a search for your keyword to find other blog posts that are on a similar topic. Yours is 10x better though so, of course, anybody linking to the posts that come up first needs to see your blog post. Who’s linking to your competition? You found your competition but now you need to look into who’s linking to your competition. MozBar is an excellent way to accomplish this. With the MozBar installed in Google Chrome, do a search for your preferred keyword in Google (or your choice of search engine). If you have the MozBar on (just click the M icon) then underneath each search result you’ll see an analysis of each website in the search results. There’s a link in there that tells you who is linking to that website. Once you have a list of websites who are linking to the competition you can reach out and let them know there’s something even better. Do your research and put together a list of people to reach out to. This is the biggest struggle because you will get a lot of rejection or no answer. It only takes one response to get a powerful backlink though. When you want to promote blog posts, producing amazing content and doing the outreach is important. Having an amazing place to put your content is just as important. Your content should not only read good but it should also look good and convert even better. The point of having a business and a blog is to drive more buying customers to you. Quality content attracts valuable leads who will spend more money. An amazing conversion focused website will make sure you capture visitors information. With the right content and a website that’s built for conversion, you’ll have a winning combination. Let me check your online presence to see how well you are set up to convert visitors into leads for your business. I will work with you to turn your business online presence into a revenue generator.